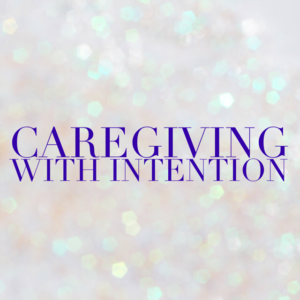 Part three in our series on caregiving with intention. More than the tactical advice I’d share, (like always book the first appointment after lunch with your parent’s doctor (your elderly parent is more likely to be ready on time in the afternoon than in the morning plus the doctor is less likely to be behind schedule at that time), I think it would be valuable to urge my younger self to think about my caregiving legacy. How will you want to feel when your caregiving experience is behind you? What do you want to remember? What would you want your parents to say about you as a caregiver? More importantly, what will you want to say? I hope you will be able to say you operated with integrity and grace; that you were a fierce advocate and a capable caregiver. It’s unlikely compassionate will be high on the list of adjectives used to describe you, but aim to place it somewhere on the list! Alas, we can’t go back in time, but we can move forward. So why not right a letter to your future self? These caregiving years are intense and busy and it’s hard to have perspective or appreciation for all we are doing and managing and handling. Send yourself a thank you note. Fill it with appreciation for all you do. Send yourself a note of encouragement. It’s been tough and it’s still tough. But you got this girl! Write it as a progress report. Benchmark where you are today so you can see how far you’ve come. Set your intentions as a caregiver. Write your future and then see how you made it happen. Tell yourself you will get through this working daughter phase and then reflect and celebrate that in fact you did. So go ahead, write yourself, and then send it! This website allows you to send your letter to your future self via email! What’s stopping you? Great idea. We could all use some encouragement from ourselves every once in a while!